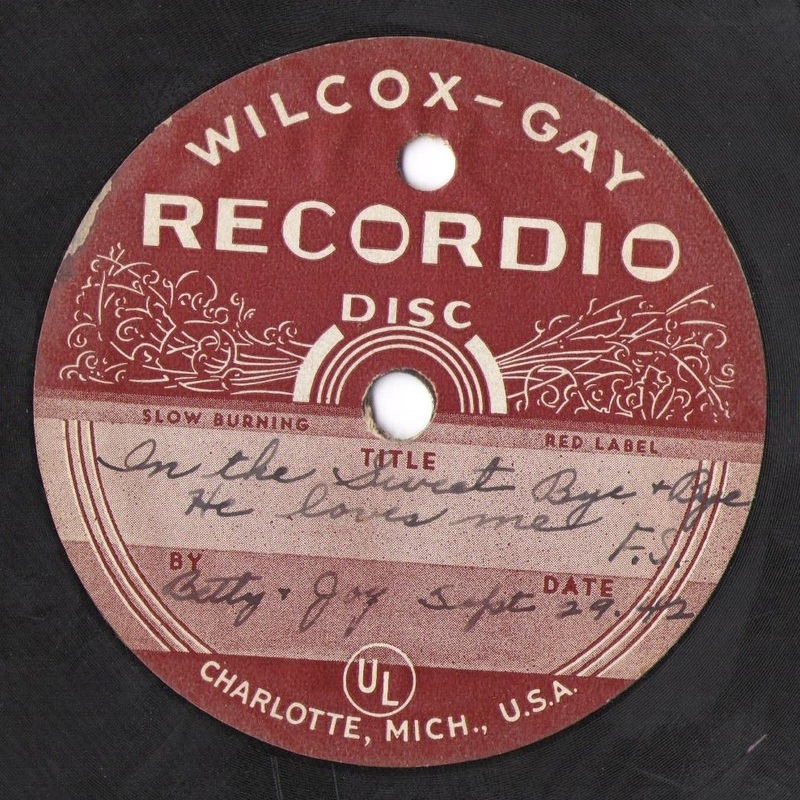 This is a metal-core 6.5 inch Wilcox-Gay Recordio. Unlike most others, this one is properly labeled. It reads "In the Sweet Bye + Bye He loves me F.S. Betty + Joy Sept 29 42." Clearly this song was recorded 72 years ago by two ladies as named above. The disc is in decent shape. I edited out a dozen pops, and ran a noise filter to bring out the voices. There's a bit of talking at the end but I can't quite make it out. It appears to be a third voice...male. The lead vocalist has a sharp strong voice and sings in a proper minor key.. and they can harmonize pretty well. It's a nice version. The Song is a christian hymn with lyrics by S. Fillmore Bennett and music by Joseph P. Webster. I know it as a standard in New Orleans Jazz funerals. I've heard a hundred dixieland versions of this tune. It dates back possibly as early as 1868. Thus is cannot be used to corroborate the date but there's little reason to doubt it anyway.